Felix Mendelssohn was the third of four children of a highly successful banking family who were also gifted intellectually and artistically. Chamber music was regularly played in the home, and his parents provided him with an enviable musical education. By the age of sixteen he had already composed thirteen string symphonies, a symphony for full orchestra, and his first undisputed masterpiece, the Octet Op20. It was at that time that he met the prodigious violinist, Ferdinand David who was one year his junior, but had already appeared as a soloist in the prestigious Leipzig Gewandhaus. The two were to become lifelong friends, and when Mendelssohn was appointed director of the Gewandhaus, in 1836, he quickly secured the appointment of leader of the orchestra for David. Two years later Mendelssohn revealed in a letter that he was planning to write a concerto for his friend and had thought of the opening melody which he said he could not get out of his head. David was clearly keen on the project. 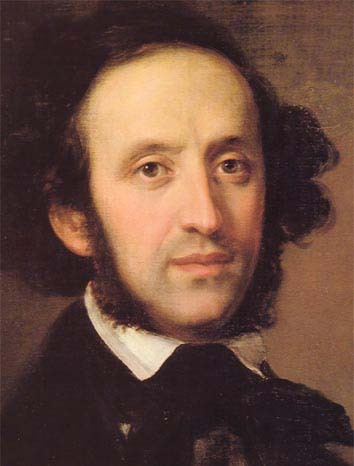 In 1839 Mendelssohn wrote to him "It is nice of you to press me for a violin concerto! I have the liveliest desire to write one for you and, if I have a few propitious days, I'll bring you something. But the task is not an easy one." In the event it took another five years for the normally prolific composer to complete the concerto. The first performance took place in Leipzig in 1845 with David as soloist, but Mendelssohn was too ill to conduct, and the performance was directed by the Danish composer and conductor Niels Gade. The concerto was an immediate success and was performed again a few months later. Shortly after this came a performance in Dresden, where the concerto was substituted at short notice for Schuman’s piano concerto. Clara Schuman who was to have played her husband’s concerto could not take the platform because of illness. This time the soloist was the 14 year old Joseph Joachim, then a pupil of David, and the performance was a springboard for his spectacular career as a violin virtuoso. Mendelssohn's music is most clearly influenced by Mozart and Beethoven, and his use of form and harmony is rooted in the classical period. However, he developed a clear characteristic style of his own, and there are many innovations in the violin concerto. For example, there is no orchestral introduction to the work, the soloist introducing the first subject, a hauntingly beautiful melody high in its register. The cadenza is placed in the middle of the first movement, rather than near the end, and leads to a magical return of the first subject, played quietly by the orchestra accompanied by arpeggios from the soloist. In its mood the concerto makes a journey from darkness to light. The first movement is restless and questing, sometimes mysterious and sometimes nostalgic. The second movement, by contrast, is based on a calm and beautiful melody for the soloist with a simple accompaniment. It is briefly interrupted by a darker and agitated episode. A brief wistful dialogue between the soloist and the orchestra prefaces the final movement, which opens with a blaze of colour and establishes a mood of joy and exhilaration which is sustained to the end by witty virtuosic melodies and lively interplay between soloist and orchestra. Mendelssohn's Violin Concerto was performed by the Portobello Orchestra on the 23rd June 2007 and the 14th July 2007. The soloist was Madeleine Easton and the conductor was Anthony Weeden.